When do we need vision? During times of growth, change or opportunity -- so that we know we're headed in the right direction. We also need vision during times of uncertainty -- when we've lost confidence in our leaders, our institutions or ourselves. Instead of focusing on 'what's next,' we need to refocus on 'what's first.' Getting back to the basics means knowing who you are, where you're going, and what will guide your journey -- having a vision. When work is meaningful and connected to what we truly desire, we tap into a productive and creative power stronger than we ever imagined. 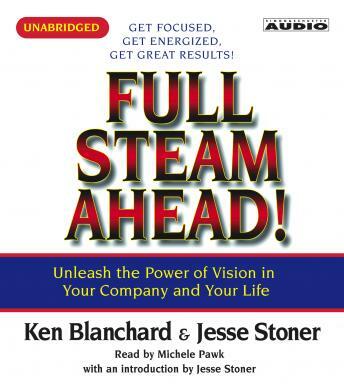 The lessons of Full Steam Ahead! are surprisingly simple, practical and powerful. They demonstrate that vision is not only necessary, but also possible and achievable. This story takes the form of a relationship between the narrator and her company president. Through the story of the narrators divorce and re-entry into the work force and her befriending of the company president, you learn the value of vision, mission and company/personal values. It is an entertaining way to learn the importance of these concepts if you can stand the pulp-romance aspect to the story.